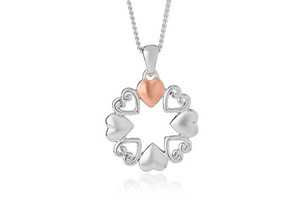 Our exquisiteÃ‚Â AffinityÃ‚Â heart pendant is inspired by love and all that encompasses. It symbolises hearts coming together on an everlasting, romantic journey. Beautifully hand-finished, this sterling silver and 9ct rose gold pendant contains rare Welsh gold - the Gold of Royalty for over 100 years.